Any mediocre Pixar release feels like a stunning disappointment, which may not be fair. No one bats 1000, and for every Cars 2 the animated giants release three Toy Storys. 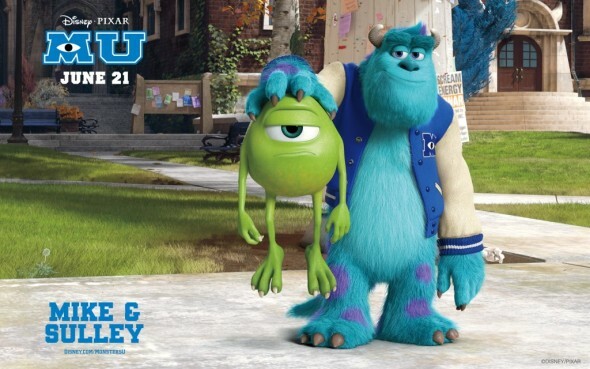 It’s an excellent swap, and to be fair, Monsters University is not quite Cars 2. Though similarities exist. First of all, it’s a sequel to one of the studio’s lesser films. While 2001’s Monsters Inc. was imaginative, clever fun, it just doesn’t measure up to, say, Up. It wasn’t a work of groundbreaking, mind blowing, heart wrenching, hilarious genius. It was better than whatever other animators were doing that year, though. But the competition’s only gotten stiffer in the last dozen years, and Pixar will need another unique and wondrous tale to really stand out. Or, they could just rehash the old Eighties staple Revenge of the Nerds for the 10-and-under set. You may remember Mike (Billy Crystal) and Sully (John Goodman), two BFFs working the scare floor at Monster’s Inc., where children’s screams are harnessed for the energy to fuel Monstropolis. (Now, see, that’s clever.) Well, as it turns out, back in college the two buddies were actually rivals. Wildly predictable plotting leads to a handful of moderately funny gags, but the film does boast a few genuine strengths. For instance, Helen Mirren plays the terrifying dean. Helen Mirren is never a bad decision. Other solid voice talent abounds, including Charlie Day, who steals scenes as Mike and Sully’s wrong-headed frat brother. In true Pixar fashion, the film is also a visual achievement to behold, the monsters offering endless tactile and color opportunities for animators, who appreciated the challenge. Directed by Columbus College of Art & Design grad Dan Scanlon, making his debut as an animated feature helmsman (he’s previously directed a documentary and a short), the film charms and entertains in a forgettable way. It’s the best solution so far this summer for wee ones, but this isn’t that Pixar gem that will stay with them until they have kids of their own. Hell, they’ll probably forget it by the time Despicable Me 2 opens.